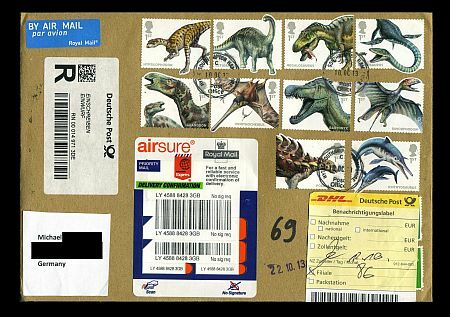 On October 10, 2013 Royal Mail, first time since 1991, launched a set of ten self adhesive stamp of "Dinosaurs" (actually four animals depicted in these stamps are not dinosaurs, but flying and marine reptilies: Dimorphodon Ornithocheirus, Ichthyosaurus, Plesiosaurus ). 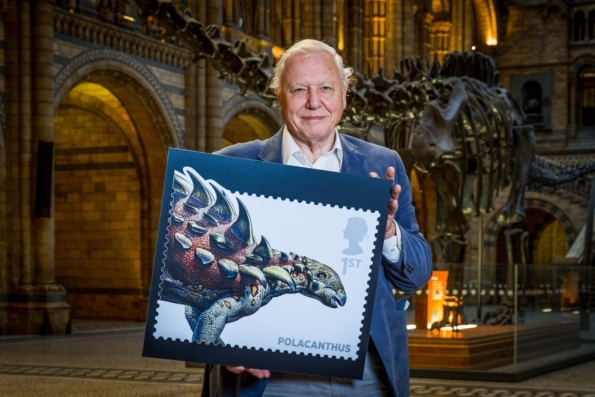 The new stamp collection is designed to celebrate the 200 year history of paleontology in Britain and the discovery of a multitude of dinosaur remains in Britain by British paleontologists. The cliffs and foreshore are the world’s most important and famous sites for marine reptiles that lived 201-195 million years ago. ICHTYOSAURUS and PLESIOSAURUS swam in the shallow seas that covered Dorset. The pterosaur DIMORPHODON flew over the water and occasionally fell in. 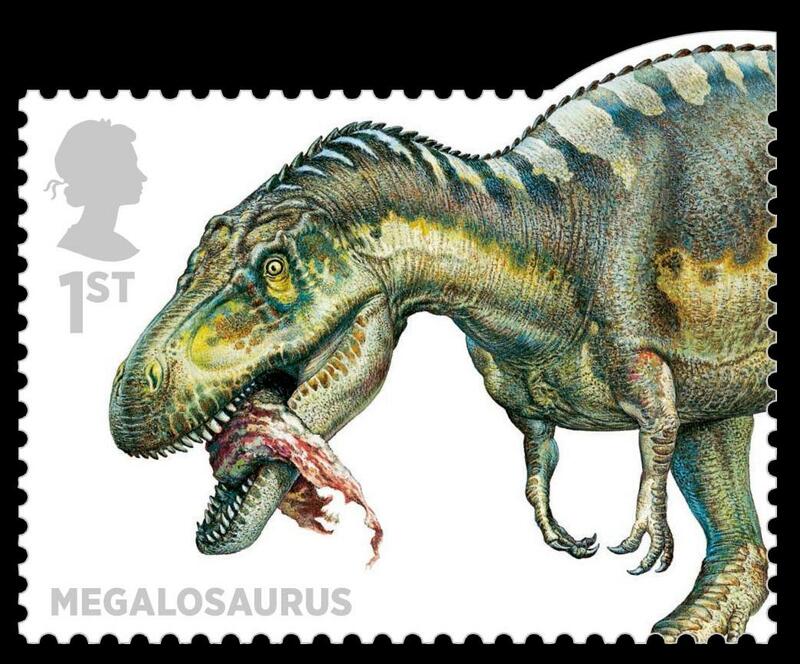 MEGALOSAURUS, the first dinosaur to be named, came from Stonesfield Quarry near Witney. 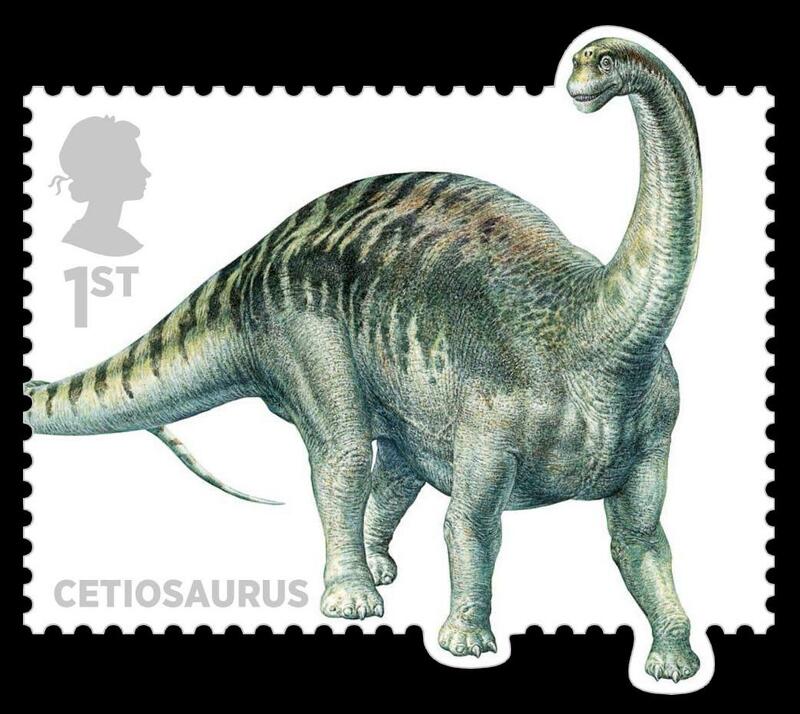 CETIOSAURUS was discovered in several locations during the 19th century, including Chipping Norton and Bletchington Station, notable for the most complete skeleton found. The only fairly complete skeleton of the fish-eating dinosaur, BARYONYX, was discovered in a working brick-making clay pit at Wallis Wood, near Dorking, in 1983. Remains of IGUANODON and a SAUROPOD have also been uncovered there. 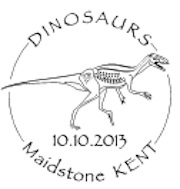 The ﬁrst recognised dinosaur fossils came from a stone quarry at Whiteman’s Green, Cuckfield. 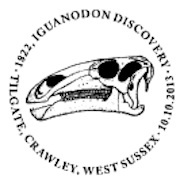 They included teeth discovered in 1822 and later named IGUANODON. Pterosaur fragments, originally identified as birds and later as ORNITHOCHEIRUS, were also found there. 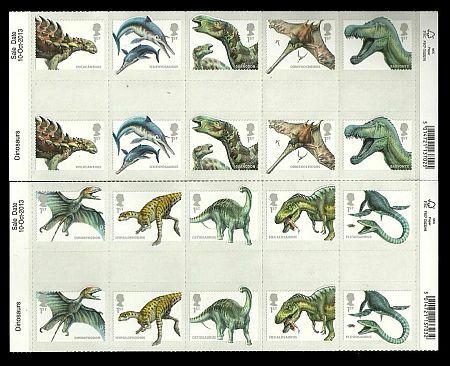 The fossils from seven of the ten depicted dinosaurs have all previously been found on the Isle of Wight, many of which are on display at Dinosaur Isle in Sandown. 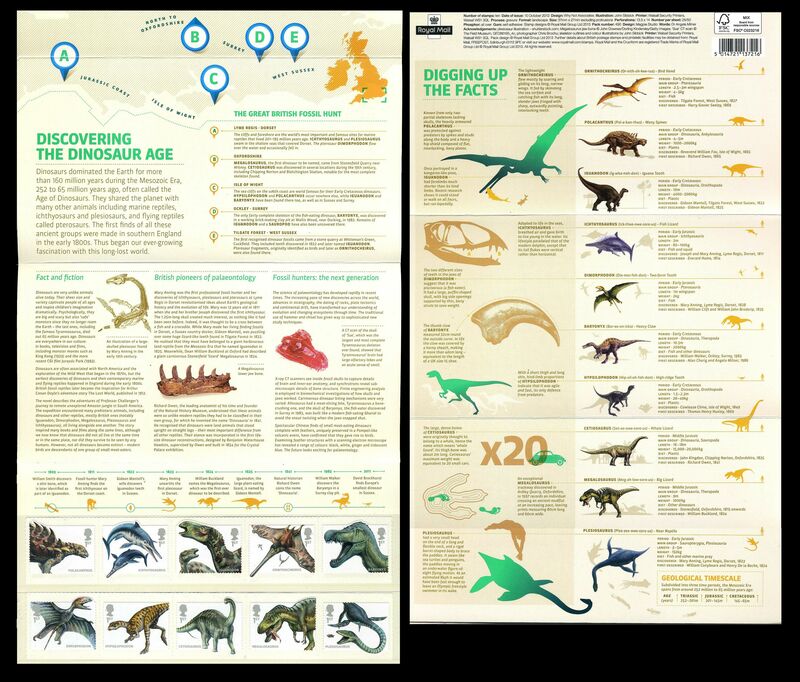 Isle of Wight palaeo-artist John Sibbick was selected from a number of expert artists as he is one of the foremost illustrators of dinosaurs and has decades of experience. It was felt that Sibbick’s painterly approach gave a more detailed realisation of the animals than tests with computer generated imagery at stamp size. 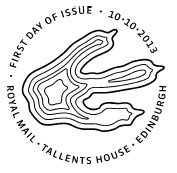 The stamp designs in this issue are printed such that the creatures ‘break out’ of the self-adhesive stamp frame, so there is not a clean straight edge to the stamp. 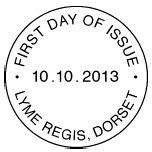 Mr. Sibbick said: "I always knew that designing and illustrating stamps was a rigorous and painstaking process. To get the opportunity was a dream come true, especially depicting the world famous dinosaurs found on the Isle of Wight. To get such access to fossil dinosaur bones, tracks and the plants in their environment on the Isle of Wight makes the reconstruction process a much more vivid experience." 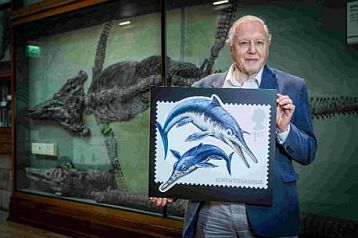 The museum will host an exhibition telling the story of the creation of John Sibbick's work.The stamps have been produced under the guidance of palaeontologists from the Natural History Museum, including the Angela Milner. 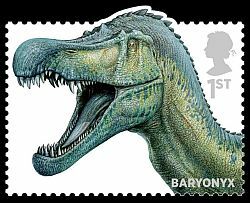 (who is along with Alan Charig, her colleague at the Natural History Museum in London, named and described Baryonyx, one of the dinosaurs featured in the set. ) Each illustration is anatomically correct to the extent of present scientific knowledge. 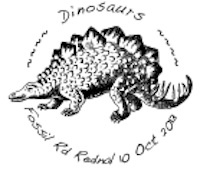 The exciting Dinosaur Island App Trail based on the ancestral links between the characters in the film and the dinosaurs on the Isle of Wight, will give you the chance to be seen standing alongside dinosaurs in the very place they were discovered. 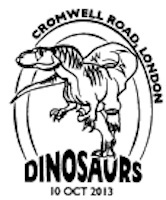 The app utilises new technology which allows you to use smart phones and tablets to take pictures of family and friends walking alongside the dinosaurs that roamed the Isle of Wight 130 million years ago, while at the same time learning more about their relatives - the dinosaur characters in the movie. The Augmented Reality App is available to download from anywhere in the world, but will only be triggered into life at six coastal locations on the Isle of Wight. 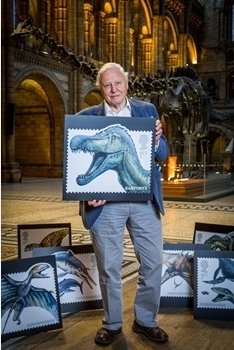 These stamps presentation, to public for the first time, took place at the Natural History Museum in London on October 7, 2013 - few days prior to official release. Dinosaurs dominated the Earth for more than 160 million years during the Mesozoic Era, 252 to 65 million years ago, often called the Age of Dinosaurs. 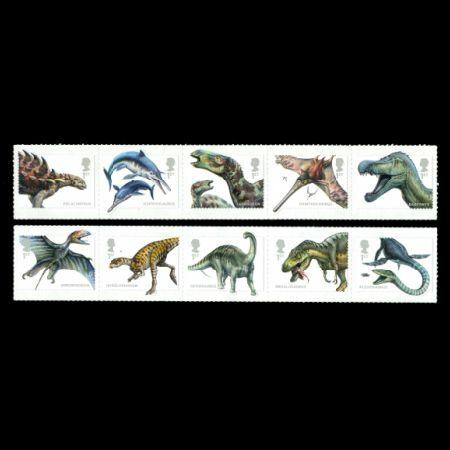 They shared the planet with many other animals including marine reptiles, ichthyosaurs and plesiosaurs, and flying reptiles called pterosaurs. The first finds of all these ancient groups were made in southern England in the early 1800s. Thus began our ever-growing fascination with this long-lost world. 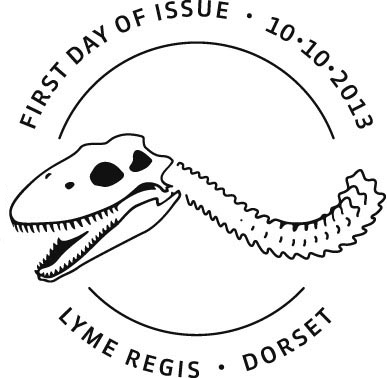 The Ichthyosaurus, the Plesiosaurus and the Dimorphodon were all first discovered by Mary Anning (famous British fossil collector, dealer, and paleontologist) on the beaches of Lyme Regis at the beginning of the 19th century, and their fossilised remains can still be found along the Jurassic Coast today. 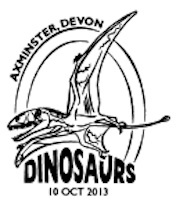 Mary Anning and her brother Joseph discovered the first ever Ichthyosaurus in 1811 on the beaches between Lyme Regis and Charmouth. Mary continued to find fossilised remains of the Ichthyosaurus during the next ten years, before discovering the Plesiosaurus in the winter of 1828. 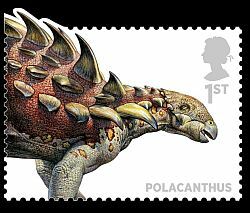 Known from only two partial skeletons, both lacking skulls, the heavily armoured polacanthus (‘many spines’) was a herbivorous quadruped protected against predators by spikes and studs along its body and a heavy hip shield of flat, bony plates. 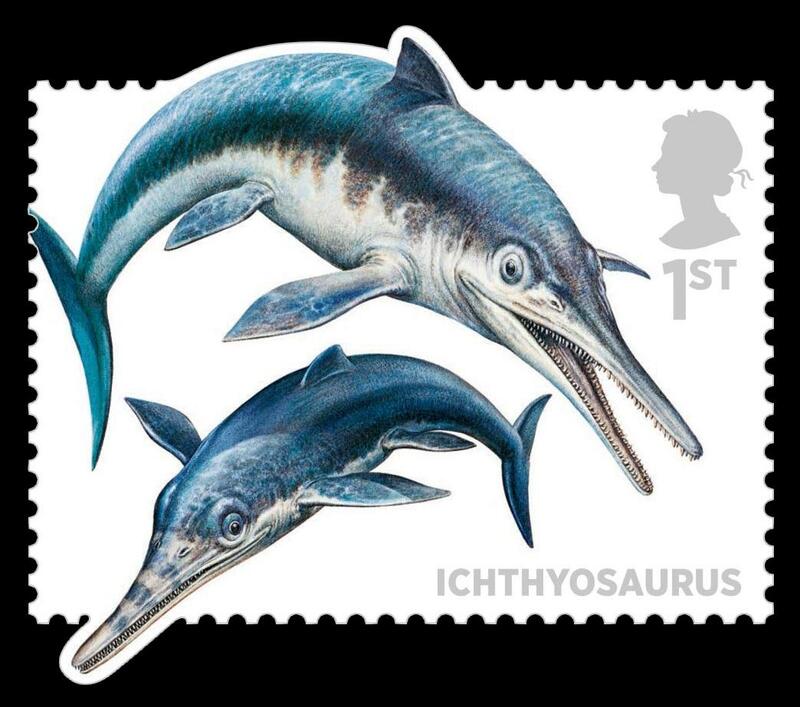 Adapted to life in the sea, the Ichthyosaurus breathed air and gave birth to live young in the water. About the size of a modern dolphin, but with vertical rather than horizontal tail flukes, it ate fish and squid. 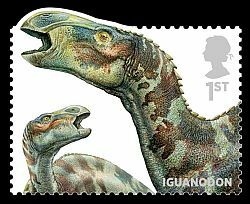 With forelimbs which were much shorter than its hind limbs, iguanodon (‘iguana tooth’) was a herbivore that could stand or walk on all fours but ran bipedally. Its distinctive thumb spikes might have been for defence or for foraging. 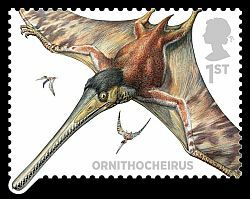 The lightweight ornithocheirus (‘bird hand’) flew by soaring and gliding on its long, narrow wings, and fed by skimming the surface of the sea to catch fish in slender jaws which were fringed with outwardly-pointing, interlocking teeth. Ornithocheirus represents the pterodactyloid pterosaurs. This species was first described by Harry Govier Seeley in 1869, though the fossils had been known of since 1827. Baryonyx (‘heavy claw’) was a land-based fish-eating creature with a long snout full of serrated teeth. It had a huge thumb claw covered by a horny sheath, which may have helped it catch its prey. The two different sizes of teeth in the jaws of dimorphodon (‘two-form tooth’) suggest that this flying dinosaur was a fish-eater. It had a large, puffin-like beak, short wings and a long tail. 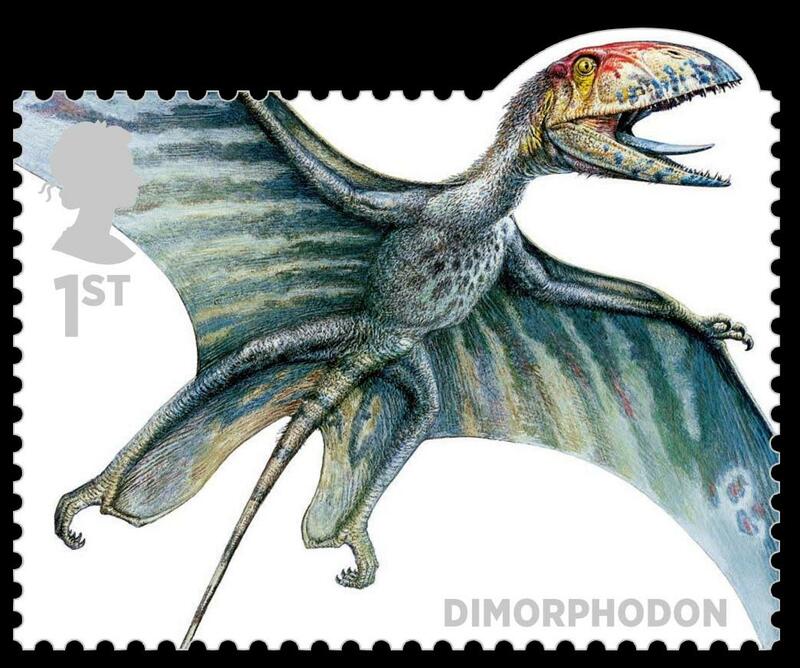 Dimorphodon represents the older rhamphorhynchoid pterosaurs and was described by William Clift and William John Broderip in 1835. 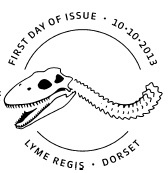 This description was based on a fossil that was discovered by Mary Anning in 1828. 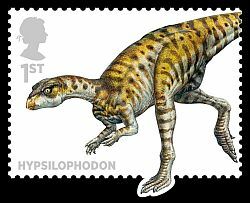 The long shins of the Hypsilophodon suggest that a speedy escape was its main means of defence. With a short thigh and a long shin, hypsilophodon (‘high-ridge tooth’) was a fast runner. With no body armour, running would have been this comparatively small plant-eating biped’s only defence from predators. 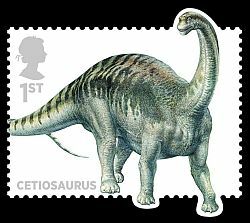 The Cetiosaurus was a herbivore thought to weigh as much as 20,000kg, the same as 20 cars. The large, dense bones of cetiosaurus (‘whale lizard’) were thought to belong to a whale when the first fossil was found, hence its name. The fearsome Megalosaurus grew up to nine metres in length, and preyed upon other Dinosaurs. Megalosaurus (‘great lizard’) was a heavily-muscled bipedal carnivore with long, curved teeth. An exceptional set of footprints discovered in Oxfordshire in 1997 records the 1.5-tonne creature crossing an ancient mudflat at pace. With its vast paddles, the Plesiosaurus hunted fish and other marine prey at an estimated 8kph. 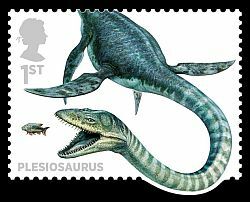 A marine reptile with a small head on the end of a long, flexible neck, plesiosaurus (‘near lizard’) swam like a sea turtle, with two pairs of huge paddles giving it good manoeuvrability as it hunted small fish and squid. 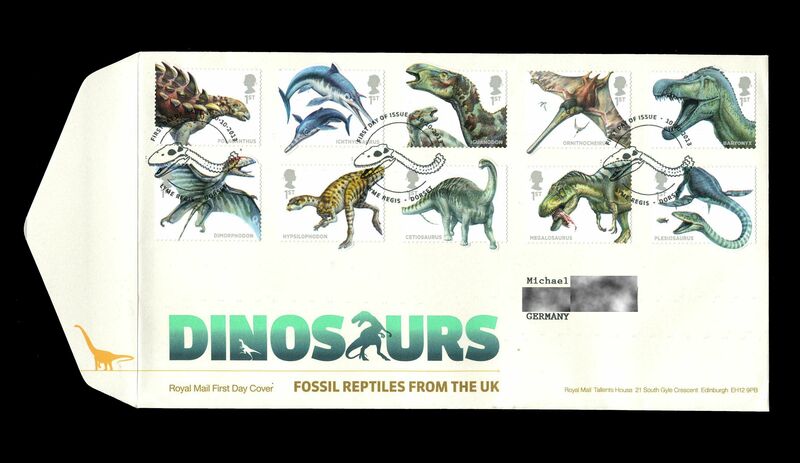 Complete with an informative filler card written by fossil expert Dr Angela Milner, this striking First Day Cover has all ten Dinosaurs Stamps affixed. 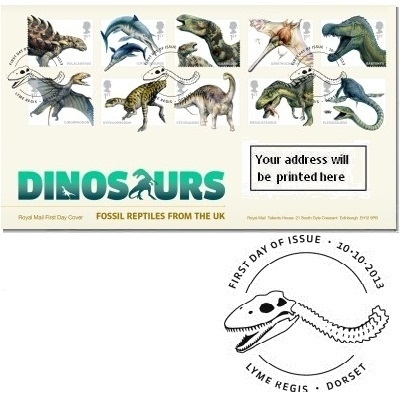 Cancelled with a Lyme Regis postmark, chosen as it was the site of Mary Anning’s landmark discovery of the Ichthyosaurus. 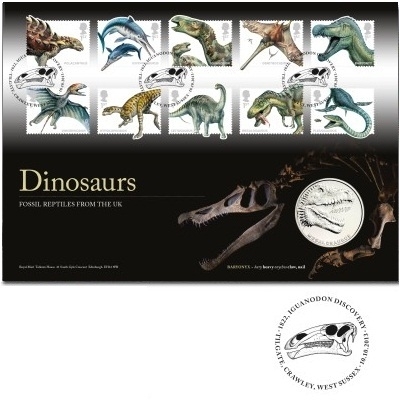 This striking cover features the Special Stamps and a commemorative medal from The Royal Mint. It also contains an insert card looking at how discoveries, interpretations and technology have worked together over the years. Limited Edition of 9,000. 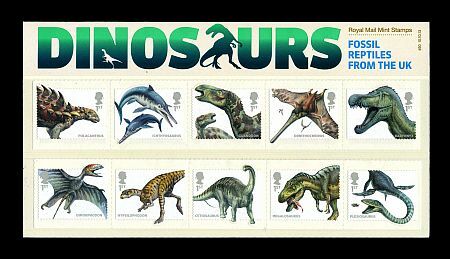 In the glorious Presentation Pack, which includes all ten Special Stamps, Dr Angela Milner of the Natural History Museum in London examines our discovery of the Dinosaur age in superb detail. She also looks at the British pioneers of paleontology and the future of the science, through a host of facts, photographs and illustrations. 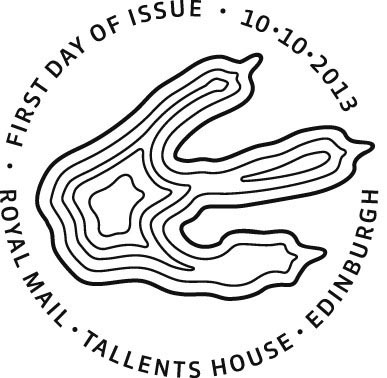 Register letter sent on the fist day of the stamps issue.